After more than two years orbiting Ceres, NASA’s Dawn spacecraft continues to tease out remarkable science from the enigmatic dwarf planet. 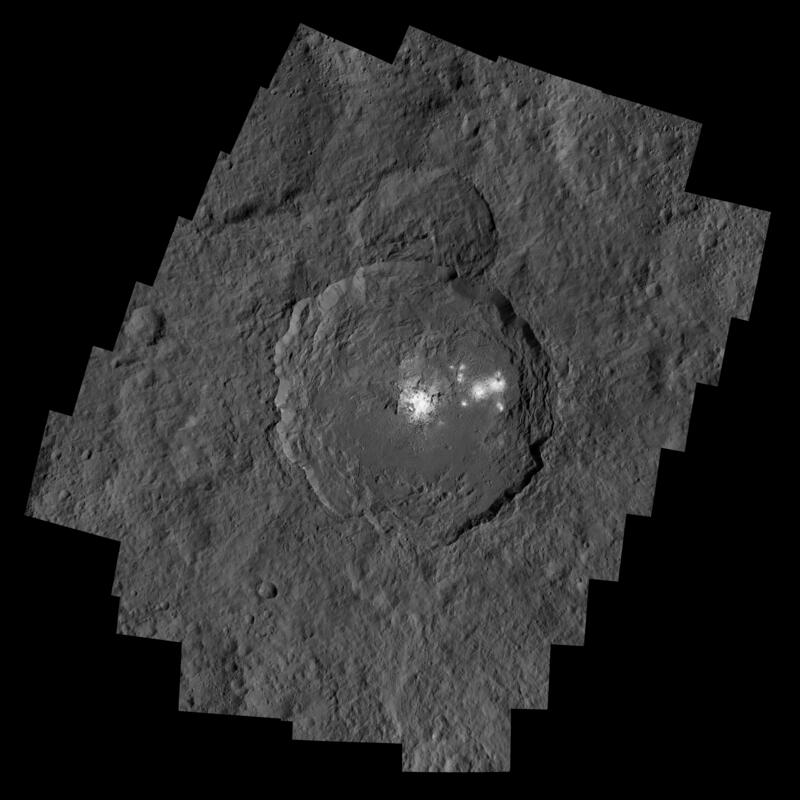 On April 29, mission specialists were able to successfully place Dawn into opposition – a position directly between the Sun and Ceres. This was done in an attempt to get important images that could answer some key questions about the tiny world. One of the key things researchers are hoping to explain is Cerealia Facula – the bright domed area within Occator Crater that is 9 miles (14 kilometers) across and rises about 1,300 feet (400 meters) above the crater floor. Opposition images should provide a unique and scientifically significant source of information that can only be obtained from this precise positioning. The goal of Dawn’s mission specialists was an ambitious one but certainly not an easy one to achieve, even prior to the loss of Dawn’s third reaction wheel just days before the planned opposition. The reaction wheel failure was discovered during a previously scheduled communications session on April 24, which occurred after the five-hour burn maneuver performed on April 22 to increase and adjust its altitude and orbit. As a result of the third reaction wheel malfunction, Dawn was placed back into its standard configuration using the hydrazine thrusters to maneuver the spacecraft the following day. Instead of being able to rely on the gyroscopic influence of the reaction wheels for positioning, the delicate maneuver now required precise activation of the hydrazine thrusters in coordination with Dawn’s ion engine to move it to an altitude some 12,000 miles (∼20,000 kilometers) above Ceres’ surface as well as to place it in an exact position between the dwarf planet and the distant Sun. 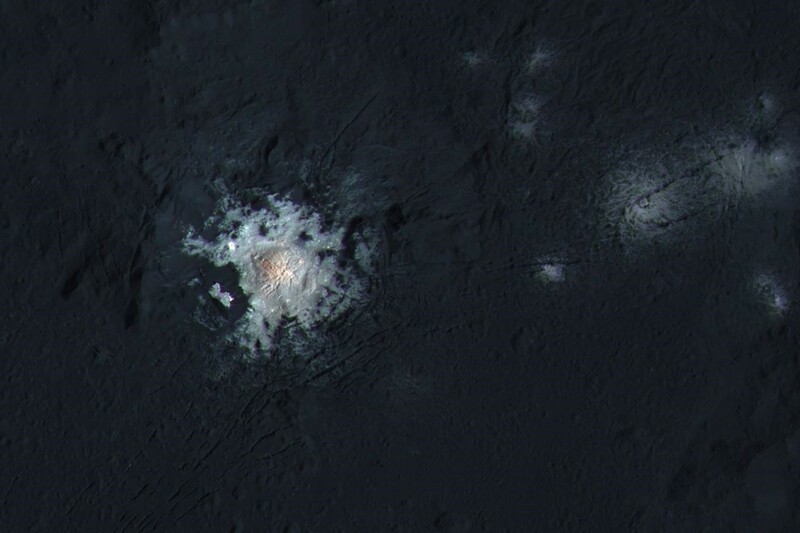 Unlike the detailed, close-up images that Dawn obtained in 2016 when it was at it closest position to Ceres’ surface, which highlighted the contrasts and allowed for the highly detailed images of Ceres’ surface, the opposition images were taken from a distance 50 times farther away and would be considered visually quite bland to the average naked-eye viewer. Despite the difference in altitude between the 2016 images and the ones taken on April 29, the real difference lies in the angle of the light as it is cast on the dwarf planet’s surface. When the light source, the spacecraft’s camera, and the object to be viewed are all in perfect alignment, the light that is cast on the surface of the object being imaged becomes significantly brighter – an event termed “opposition surge“, “opposition effect“, or “Seeliger effect“. The surface of the object, specifically the size and porosity of the material, can cause significant alterations in the surge and even a fraction of a degree off of opposition can make a huge difference in the resulting brightness of the image. The surge was first noted in 1887 by Hugo von Seeliger when viewing Saturn’s rings and is thought to happen due to a combination of different physical events happening in concurrence. This combination likely results in a significantly brighter image of the object primarily due to shadow hiding and constructive interference, or coherent backscattering. Seeliger noted the surge in brightness of Saturn’s rings and that it was likely caused by shadow hiding due to the brightness of the individual grains of dust and particulates of the rings being directly lit. Shadow hiding is a brightening due to the difference in angles of the light as it falls on the surface of an object. When the light shines at an angle, the amount and density of the shadows cast on the surface is significantly reduced, creating a nearly imperceptible difference in the visible light to most eyes but is picked up by the CCD imager on the spacecraft. The greater the angle between the angle of the light and the camera, the more the surface is shadowed, cutting down on the overall brightness of the image. When the degree of difference is eliminated, the amount of surface shadowing is virtually eliminated as well. The other primary cause of opposition surge is due to constructive interference, or coherent backscattering as it is also known. Constructive interference is when two or more waves of light with the same frequency (length from peak to peak of the wave) interact with one another, causing the amplitude, or strength, of the light wave to increase as a sum of the waves. In other words, if wave 1 and wave 2 have the same frequency but wave 1 had an amplitude of 5 and wave 2 had an amplitude of 3, constructive interference would cause the strength of the both waves to become the sum of waves together, so 5 + 3, or 8. Another way to look at it is that the waves combine to form a larger wave equal to the individual waves added together. In the process of arriving at the right alignment for opposition, Dawn took many images to track the amount of shadow hiding that occurred at opposition surge. Previous images that were taken at a variety of angles, as well as the overall brightness of the opposition images taken directly in line with the light source (the Sun), hope to reveal some of the persistent questions scientists have about some of the landmarks of Ceres. One of those questions is about Cerealia Facula and the other Vinalia Facula (facula meaning “bright spot”) within the Occator Crater. 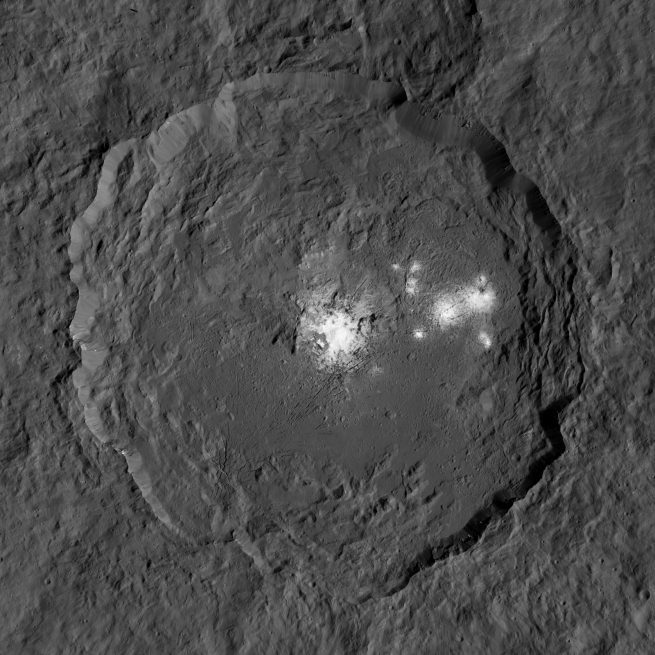 This now iconic bright area on Ceres has fascinated scientists since it was first viewed during Dawn’s initial approach in late 2014 and into 2015. Using infrared spectra, it has been previously determined that these bright areas are composed primarily of carbonate salts, with the strongest specific candidate being sodium carbonate (Na2CO3). The primary question nagging scientists is just how and where these salt deposits formed. It’s clear that, when looking at the Ceres images from 2016 at closest approach, there are cracks and fissures in the surface of Occator Crater that lead from Cerealia Facula and the other faculae, and that the salt deposits follow along these cracks. It is thought that the faculae may be tens of millions of years younger than the Occator Crater itself, and the question that scientists hope will be answered by the opposition surge images is how the salts of the faculae arrived where they are. One hypothesis is based on the size of the salt crystals which could be determined by comparing opposition surge images with prior images. If the salt crystals prove to be small and cast smaller, less dense shadows, this would suggest that the brine that contained the salts may have seeped up from beneath the surface, at which point the water was quickly sublimated (turned from liquid to gas) leaving the salts behind. If the size of the crystals are large and cast larger, denser shadows, this would indicate that the brine may have pooled beneath the surface for an extended period of time, long enough to allow the crystal to grow, and that they were pushed to the surface by some, as yet, unknown geologic force. Dawn’s active observations of Ceres, now in its third year in orbit, are providing scientists with a plethora of new insights not only into this fascinating world but also into the understanding of surface properties. Researchers are currently analyzing the new images and data. Despite the loss of the third reaction wheel, Dawn continues to able to orient itself with the hydrazine thrusters and is a healthy spacecraft.